Longarm Chris: Thank you, thank you! I just want to say a big thank you to Katy for tweeting and blogging about my new blog. I also want to say another big thank you to all of you that took the time to post such lovely comments. I am very touched. I know that some of you asked me questions and I will endeavour to reply to you as soon as possible. As Katy so rightly says, I am very new to this technology stuff so you will have to be patient with me if I post photos upside down, forget to add links and generally make the odd booboo!! You may find it hard to believe but I didn't have a proper mobile phone till last weekend - hands up you in the back row having a good laugh!!! I had an old pay as you go phone that still had the original £20 credit on it when it finally died! (5 years after purchase!) I'm the sort of girl that if she wants a chat, makes a cup of tea then sits down in an armchair to have a good chinwag on the house phone. I now have a brand spanking new Samsung Galaxy Note to play with so there is plenty of potential for mishaps. Scary!! My Dad died 3 years ago this November and for the final month of his life he was cared for in a wonderful Hospice in West Worthing, Sussex called St Barnabas Hospice. He had Alzheimer's and cancer and that last month in the hospice was a real blessing. It allowed my mum, who had been his carer for over 7 years, to just spend time with him, talking and sitting with him without having to worry about all the physical aspects of careing for a very confused sick man. Likewise my sister and I were able to visit freely and spend time with him, even though, at times, he didn't know who we were!! When he died, I wanted to make a quilt in his memory and then give it to the hospice to use for fundraising. This is the quilt I made. It is a Dresden plate quilt made of all the brightest, most cheerful scraps I could find in my scrapbag. 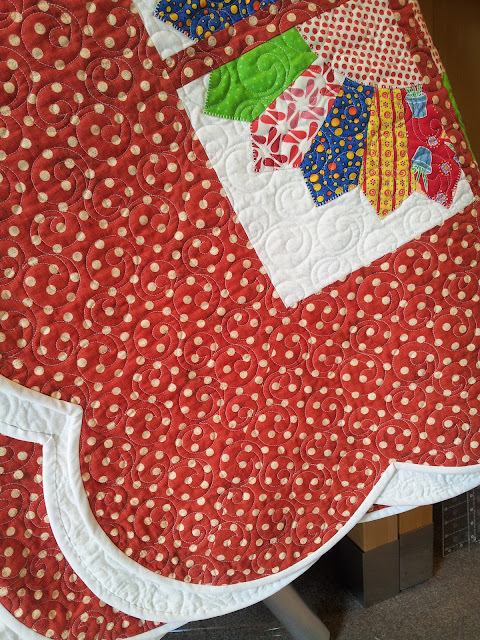 I quilted it with an allover pattern called 'bubbles'. I presented it to the hospice and hoped they could use it to make a good sum of money to use for their good work. 18 months later, I got a phone call to say that they had no idea of its intrinsic worth and didn't know how to use it to raise funds. Long story short, I said would take it back and use it to raise funds for them myself and then just send them the cheque. I had almost forgotten what it looked like but when I collected it, I fell in love with it all over again. Therefore, I just thought I would share some photo's of it with you. I am still trying to figure how I can raise funds with it but when I do, I will give you an update on what I managed to make for the hospice. Our hospices here in the UK are totally free (you may have them in the USA too?) and they do a marvelous job careing for the terminally ill and they rely heavily on fundraising to keep going. Making a quilt to raise funds was certainly less painful than running a marathon to do likewise!!! This was not meant to be a sad post. I just did it because I have been moved reading many blogs which have shown how quilters have responded to family crisis, environmental disasters, war hero's, sick and needy children and babies etc. by making a quilt from the heart and using it for good. After all, a quilt is a big fat fabric hug!! Beautiful quilt!Is there an Alzheimer's organization near you who could do the promoting of the quilt? Publicity would be the key. No, HA!, these kinds of centers are NOT free in the US, health care is a BUSINESS here. You do amazing work! 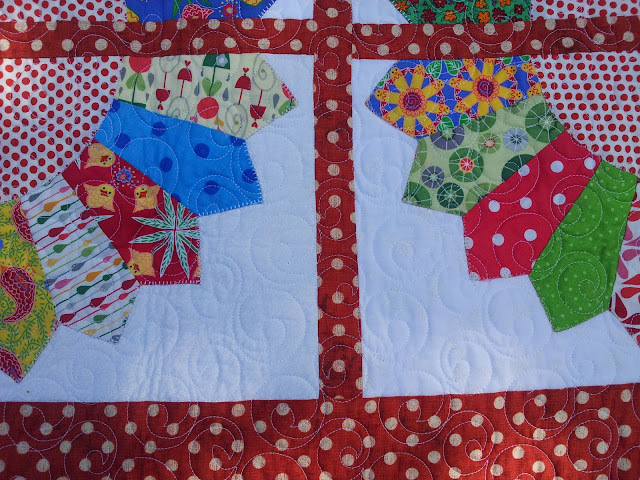 I am new to quilting because someone gave my mom a blanket at a very hard time and it changed her life. She was in the hospital recovering from being in a coma for a long time. She has terrible Multiple Sclerosis and that quilt gave her comfort in a white walled hospital room. I was inspired and want to have the ability to share that fabric hug with others. I finished my first quilt last week. While it won't win any awards it is the start of a new chapter in my life. Love that you said a quilt is a fabric hug. It is so true. Oh, what a gorgeous quilt! Is there a local quilt show or big church fair or something where you could hang it and sell tickets? Could your region of the Guild help? I'm so glad you've enjoyed your introduction to blogging but I'm not in the back row laughing at you only recently getting a 'proper' mobile as I don't have one and there's no prospect of me getting one!!! Beautiful and bright fabrics! 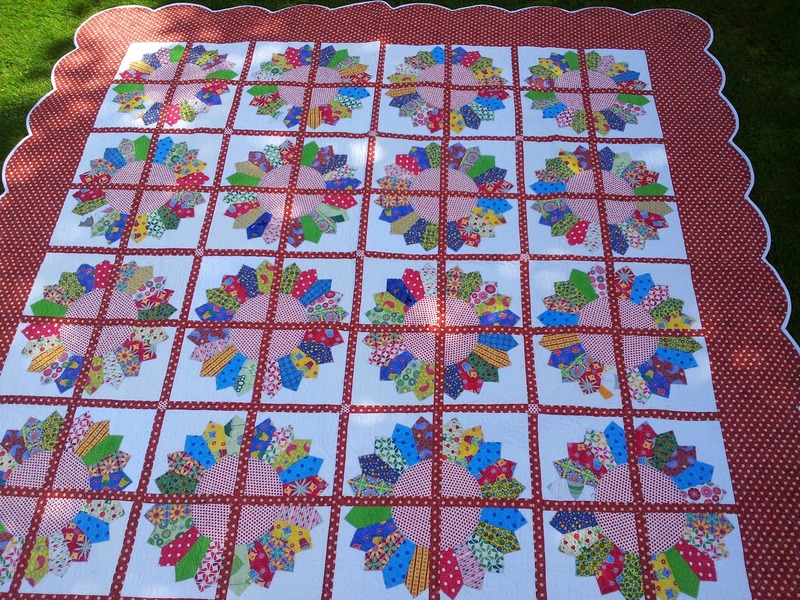 And I love the bubbles quilting pattern - so fun. Good luck in finding out how to fundraise - it's such a worthy cause. It's a beautiful quilt Chris! Maybe you could auction it at a charity event, or summer fete? 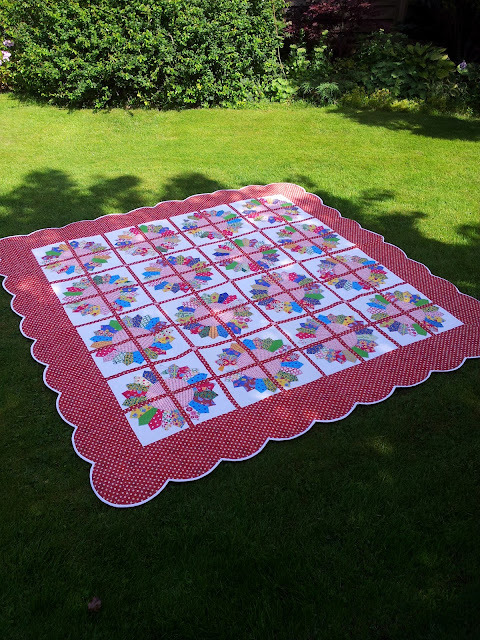 Lovely quilt :-) Maybe you could do your own auction on a blogpost? highest bidder? This quilt is so beautiful & the quilting is really gorgeous - not surprising really as I've read on Katy's blog about what an amazing quilter you are. It's terrific that you've started your own blog & I'm now following your quilting/blogging awesome-ness. Oh gosh Chris, it's really gorgeous! Wowweee! Such a beautiful quilt, and what a lovely way to remember your dad :) I'm sure you would be able to sell charity raffle tickets by having it as a winning prize. Best of luck. Beautiful quilt, all the best for fundraising. I would bet that with the publicity that Katy, Brioni, and the other Fat Quarterly peeps could generate simply listing this lovely quilt on Ebay probably be enough. Between them they have thousands of followers who have followers of their own, all over the world. It's a beautiful quilt, Chris. Using it for fundraising comes down to two options: one person spending a lot of money to buy it outright, or lots of people spending a little money for a chance to win it. Both have advantages and disadvantages. You have the potential to collect more money with a raffle, if you can market it widely (shouldn't have trouble with that if Katy gives you a shout out and you ask other bloggers to talk about it). There are legal issues that you would need to be very careful about, especially if you did it online. Different countries have different rules. There are fewer legal issues with selling it outright via auction, but then you're relying on a single person for the total purchase price, which could result in a much smaller donation. If you go for the raffle option, get legal advice from someone who knows what they're talking about. Good luck! Thanks for your post. I'm going to look into the legality of having an online raffle as I feel that more people would be prepared to pay a small amount for a chance to win the quilt rather than one person having to stump up all the money in an auction. I will post progress on my blog. That is a really beautiful quilt. I'll buy a ticket - It's a beauty!!! Hi Chris, a beautiful quilt and a wonderful cause. You could run a raffle online for charity through the well known online charitable giving site: JustGiving (www.justgiving.com). The beauty of a site like this is that it is reputable, people can register with the site and Justgiving deal with payments, and the money goes directly to the charity. You can also do a page with pictures and a write-up on whatyou are raising money for.